I never really understood why shops put the Halloween stuff out several months in advance... until having a three year old. Gracie is so excited about Halloween this year. She talks about what she wants to be (a monster, a mermaid, a princess... ), she talks about Halloween movies she wants to see, she points out every monster and ghost toy she sees at Target, and she was quick to sport her new Halloween shirt from Target and her new Kandy Korn Korker bows from Winklepots, my favorite Etsy shop. In a way, I'm kind of glad Halloween has started so early, because we will have two months use out of this outfit, rather than just one. And Gracie couldn't be happier - or cuter! 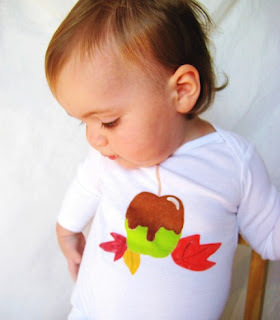 Holly of Winklepots Wearable Art and Accessories, is gearing up for the holiday season and her hand painted children's outfits and accessories couldn't be more adorable. 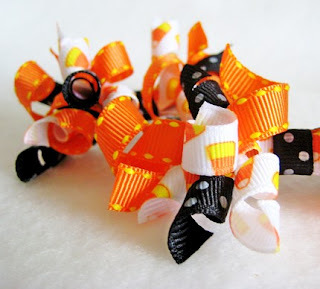 Her korker bows ( in both clips and pony-o's) are the cutest ones I have seen. 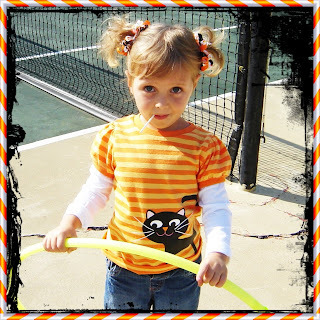 Gracie and Annelie have 7 sets of them, and they are our favorite hair accessory. Crisp autumn has come to West Texas, and there isn't a better way to welcome the season than with caramel apples! 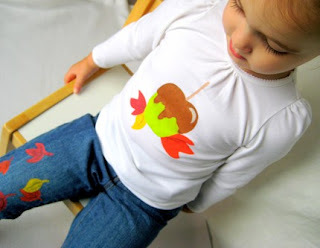 I am completely in love with the hand painted Caramel Apple outfits in Holly's shop. 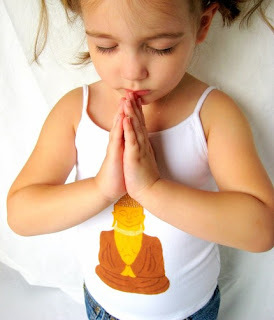 And, while this Zen Buddha tank top isn't quite Autumn related (though the colors are Fall colors), I couldn't help but show it off, as this is the cutest picture I have ever seen . Seriously, too cute. You can find all these and more at www.Winklepots.etsy.com. ...And I love my colored pencils. 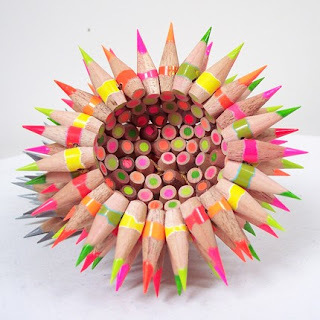 Oh, how I love those colored pencils! 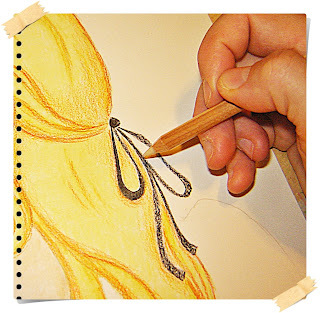 I've gone on about my colored pencils before, and this most definitely will not be the last, but right now I am in such a colored pencil-loving mood, that I can't help but devote an entire post to them. My colored pencil love affair began at the tender age of 12. Maybe that is why I can't shake the colored pencil. 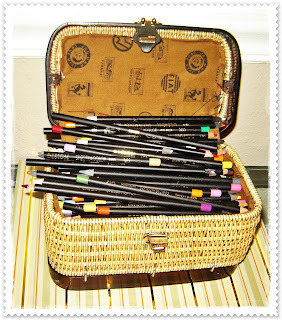 You never forget your first crush... and mine happened to be for a pack of 60 gorgeous black Design Spectracolor pencils with lovely colored tips. 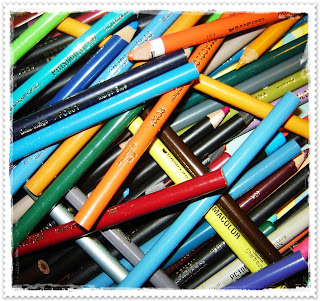 I remember it well... the hours I used to spend holed up in my studio (aka my bedroom) while all the other kids were out at the mall, just rearranging my pencils so that the colored tips looked beautiful next to each other. I kept sketchbook upon sketchbook, always filled with colored pencil illustrations that I drew with my beloved Design Spectracolors. In high school, my pencil case fell apart and I bought them this vintage purse, so they could be lovingly tucked inside. 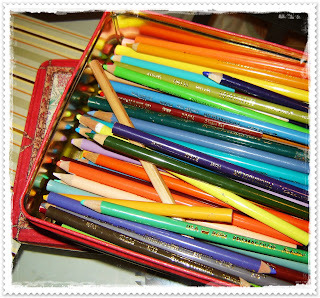 My colored pencils were more stylish than I was. I was also introduced to Prismacolor pencils, which are nice... but not Design Spectracolor. 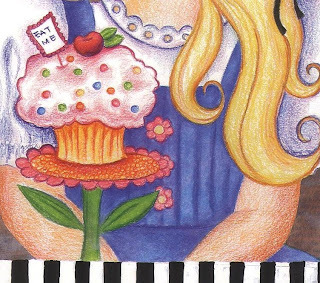 Any colored pencil artist who has tasted the beauty of a Design Spectacolor (I don't actually mean eat them) knows that a Prismacolor will never compare. 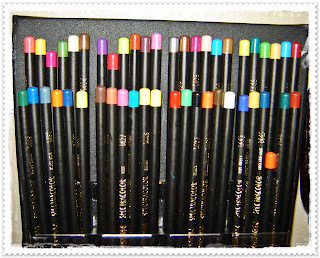 And then in 1998, Design Spectracolor pencils were discontinued. The company was bought by the company that owns Prismacolor, and then the Design Spectracolor was no more. At the age of 17, I cried. How could they do that to me? Didn't they know, didn't they understand that my pencils meant more to me than any boyfriend I'd ever had to that point (actually, I'd only had one, and only for a month. I was a late bloomer)? And here I am, 10 years later. Still in love with my beloved Design Spectracolors, still devastated that they were discontinued, and more than happy to drop a small fortune for them on Ebay. Last weekend, I spent about an hour with my racing heart in my throat, as I waited for an auction of 48 practically new Design Spectracolors in their original case, to end. Luckily, I learned about Auctionsniper.com (bless the Etsy forums!!) and had set a snipe (I do not feel like a cheater, in case you are wondering. Those pencils were that important) and as luck would have it, I won!! It wasn't an easy feat, of course. Another colored pencil addict had snuck in their high bid in the last 10 seconds, and I probably would have lost had it not been for my 7-seconds-to-go snipe. But I won, I won, I won won won... and I'm completely on the moon with happiness. 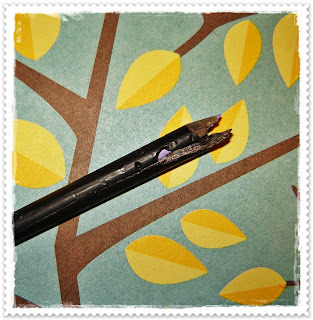 Sometimes tragedy does strike in the form of a chewed up colored pencil, complements of the family dog who is soooo on my hit list as a result. But for the most part, those pencils are cherished like a precious baby. For all of you other colored pencil lovers out there, shout it loud and wear it proud. 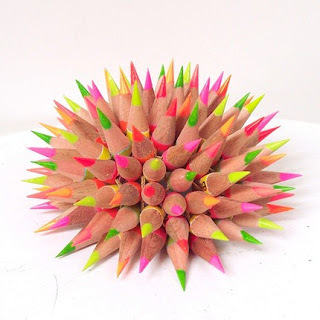 I found these awesome colored pencil accessories on Etsy, and just have to share. 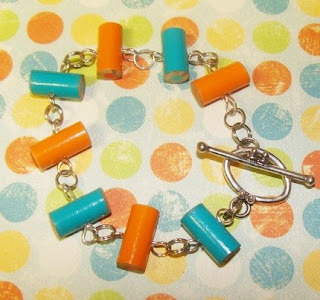 The colored pencil jewelry from Stacey Dawn Designs is just too cute. 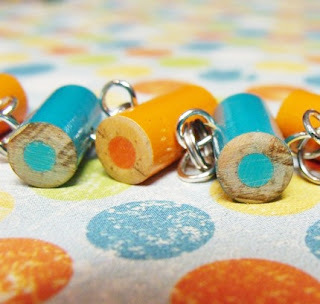 I love her fabulous colored pencil bracelets, which look just fabulous and I'm sure have that gorgeous woody pencil smell. Mmmmm! And did I mention they are fabulous? You can find her shop filled with fabulous (yes, fabulous!) pencil jewelry at www.StaceyDawn.etsy.com. 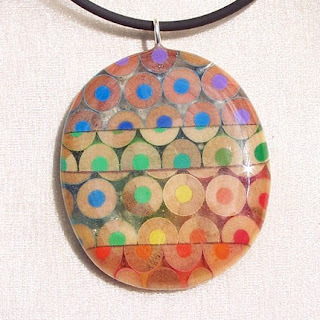 Jen Maestre has the coolest pendants, ACEOs, pins and sculptures made from colored pencils, that I have ever in my life seen. Actually, they are the only ones I have ever in my life seen, as I'm sure Jen is pretty much in her own niche. 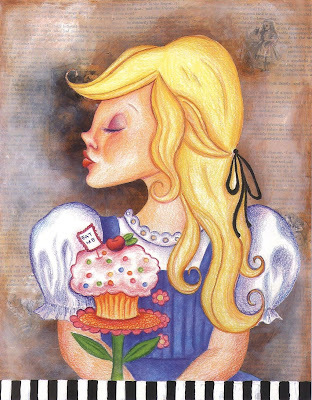 I showed you all my Alice sketch a few weeks ago, when I was first inspired by my lovely new sugar bowl, but now she is finished and I thought I'd share her with you. She is a little different than my other snobs. Firstly, she isn't blended quite like my other snobs. In fact, with the exception of her first layer of skin color, which you can see me blending in the top photo, she is barely blended at all. This means that there is a lot more of the texture of the paper behind her, and the look is a bit scratchier than my usual work. I love the look, however, so I'm quite pleased with my new snob. The second major difference is the background. 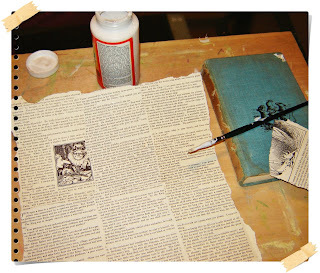 I decided to go with a dark, collage look using brown paints and vintage text. 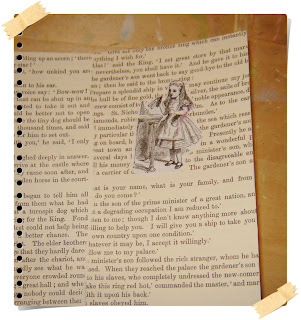 Not quite like my light backgrounds with pen and ink elements, but perfect for Miss Alice and her Wonderland. Here are my tools of the trade. My Design Spectracolor pencils (no Prismacolors this time. I just don't like those pencils!! 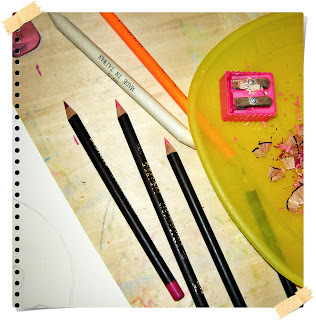 ), which are always compulsively sharpened; My Pink Pearl eraser, which I am never without; And a blending stump (for when I use solvents), which I used on her face and dress. I'm never too keen on the under layers of a picture. I use a lot of pink and magenta, which you can see on her eyelid and eyelashes. 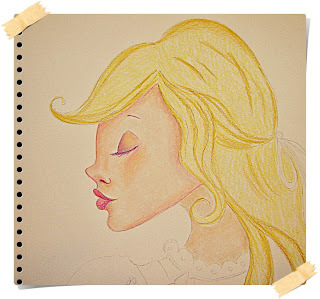 After the magenta layer, I usually add in some violet, and then finish the eyelids and lashes with blue violet. I don't like to use much black in a picture, and generally get my shading done with violets and blue violets. 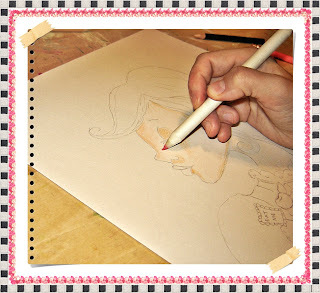 Prismacolor makes a colorless blender pencil, which I love and adore and have a million of. I use them when I need to blend in small areas, such as this thin, black ribbon. For larger areas, I use my solvents to blend, but after last weeks ER visit, it probably isn't surprising that I didn't use them much this time. I wanted to go with the dark painted background on vintage text, so I pulled out my ratty old book, which was too mangled to read, and pulled out a few pages. 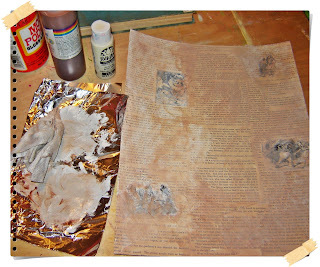 Then, using Mod Podge, I glued the text to a piece of 11 x 14 Bristol board. Then I had to pause and take a picture of Annelie laying on the floor next to me, drinking mango juice and laughing like a maniac in her diaper. And look, she finally let me trim her bangs. That wasn't an easy feat, I assure you. Of course, when I was done, she looked up at me and said, "More?" 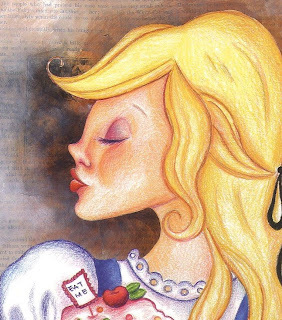 Tenniel's original Alice illustrations are public domain, so I thought it might be a fun touch to add some of them to the background of my illustration. 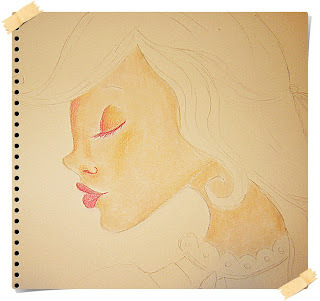 And then I began to paint. There is no method to my madness. I just tend to grab the first thing in sight. Which, in this case, happened to be the most sophisticated of artist tools: A foil palette and a diaper wipe). Well, mostly done. I finished her and then noticed that I accidentally cut off the bottom left section of her skirt. So now I have to make a new one. 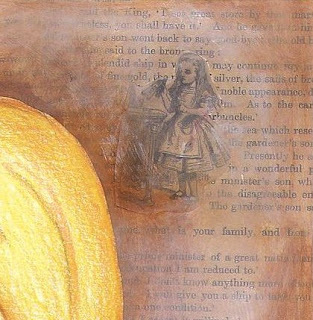 A close up of the Tenniel illustration in the background, although now that I see it up close, I think I'd like to blend it in a little more. I don't like that bit of white behind it. And of course, I had to add a cupcake. Mmmm... I love cupcakes. Design This Design That Magazine, issue 2 is available to read and download, and I must say that this 175 paged e-zine is just about the greatest thing ever. 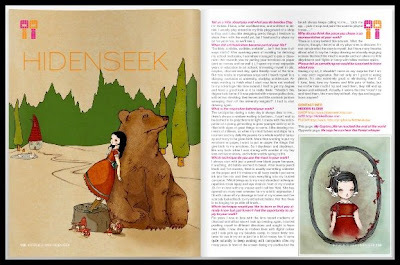 Of course, I say that partly because Elegant Snobbery has been included with a 2 page feature and interview (woot woot!) 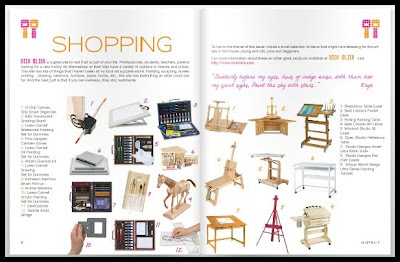 but on top of that, this ezine is a visual treat and illustrator's dream, as it is filled with a wealth of information for artists, including resources like where to shop, information about Illustration Friday, spotlights on artist from Flickr and Etsy... and 68 artist interviews! 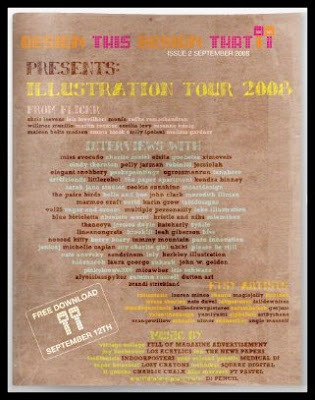 Ariadna Ramley, the fabulous creator of Design This Design That, did such a beautiful job and I really wanted to high light a few of my favorite artists featured. I was beyond honored (read: completely jump up and down ecstatic) to be included amongst such fabulous artists. Here are a few that I was particularly excited to read about, as I love these artists and their work and am a big fan of reading interviews so I can get to know them and their work just a little bit more. 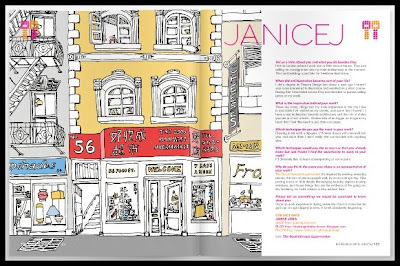 Janice J's ink city street illustrations have been favorites of mine since I discovered her on Etsy a few months ago. They definitely make me long for city life, as they are so charming and remind me of the hustle and bustle (not to mention the shopping!) of city life. The illustrations of Hide N Seek are just absolutely, without question, adorable. They are full of darling children, out and about in nature, and lounging around with bears and other woodland creatures. 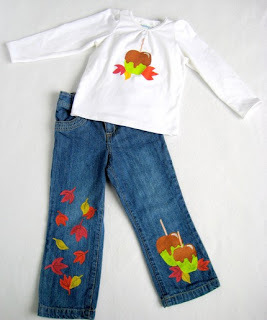 The simple yet exquisite style and color washes are so classic and sweet. Who doesn't find the animal portraits, created by Berkley Illustration, the most adorable portraits ever? Of course, I do like my snobs... but that giraffe is pretty darn cute, if I do say so myself. 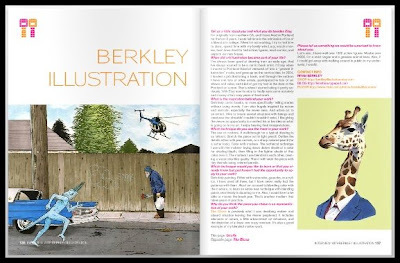 Berkley Illustration has created tons of other adorable animals, dressed in their best, with very serious looks on their furry and feathered faces. I love them all. 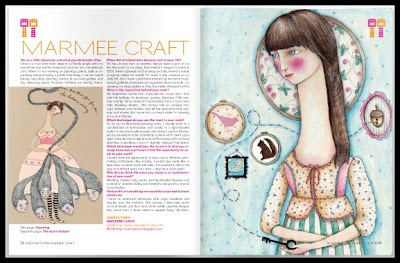 The illustrations by Marmee Craft are amongst my absolute favorites on Etsy. Whenever I am in a creative slump and feel like a pick me up, I just pop over to her shop and browse. 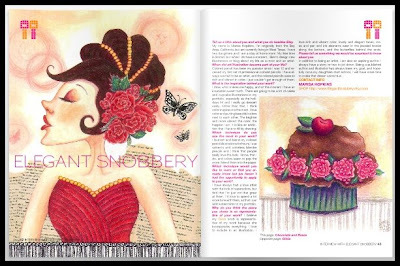 The illustrations are so whimsical and sweet and filled with romantic ladies and fanciful critters from days gone by. I love them! 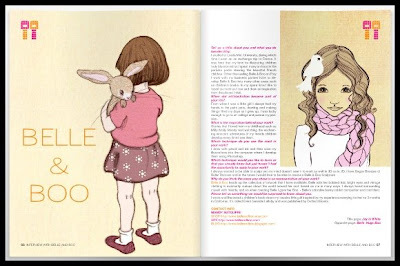 Belle and Boo... oh my goodness, the illustrations are of the sweetest and dreamiest children and I can't help remembering all the best moments of my own childhood when I look at them. 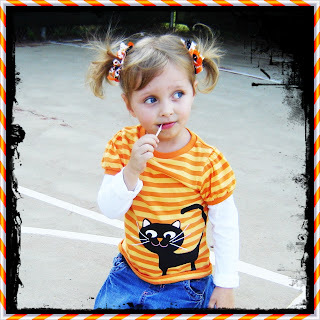 The colors are light and sweet, and the images are just beautiful! 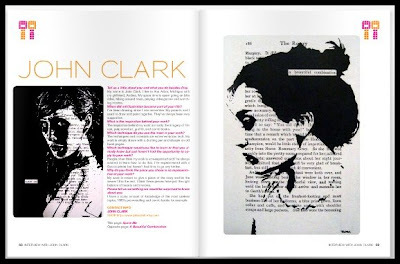 The ink on text portraits by John Clark are awesome. Just awesome. I don't know what else to say, except that the women are completely alluring, his technique is flawless, and the ink on text is one of the coolest things I have ever seen. Can you see why I am so excited to be featured amongst such awesome artists? I only wish I had enough time and energy to continue showing you all the other artists featured. But you will just have to take a peek for yourself. As for me, well I'll be busy reading for awhile. See you when I'm done! I have two little water babies. From the minute she was born, Gracie was in love with the water. As a baby with colic (oh the nightmares!!) Gracie only found comfort in the bath tub. Now, at three, bath time is still her favorite time indoors... and swimming time is her favorite out doors. 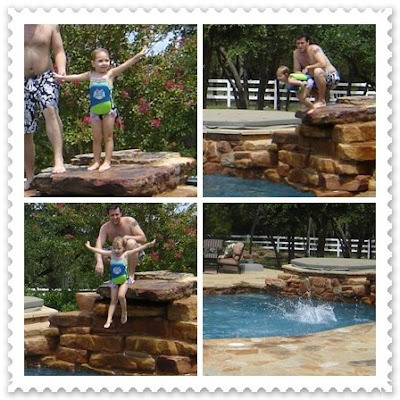 When we were in Austin a few weeks ago, we went swimming at my grandparent's house, and Gracie blew us away. In her little life jacket, Gracie bravely walked up to the top of the diving rock and jumped off. Just like that. No hesitation, no fear. She loved it so much that she spent the better part of an hour practicing all of her fancy diving - mostly flapping her arms like a bird, but there were two belly flops thrown in the mix. Will is in 7th heaven, watching his little swimming and diving champs. 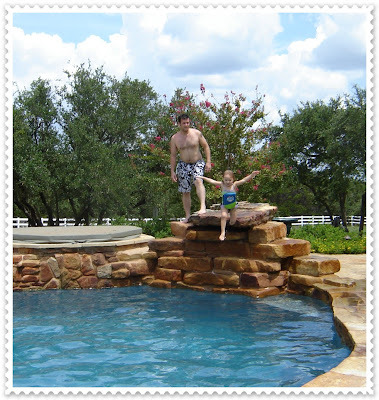 I'm not too keen on swimming, as I'm like a cat in the water... but Will has always loved swiming and has always hoped our daughters would too. Even Annelie can swim from one end of the pool to the other without anyone holding her. She does have her life jacket on, but that still takes amazing balance for her not to flip onto her back! 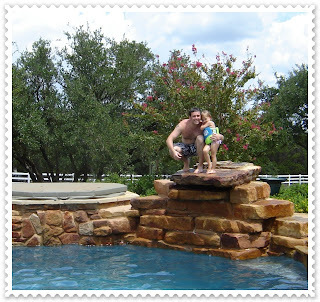 We watched the Olympics with the girls this year and the swimming and diving events were fun for all of us. Gracie and Annelie were mesmerized by the fancy high dives and the synchronized diving. And they jumped and cheered along side me and Will as we cheered on Michael Phelps. Next summer will be swim lessons for both girls. I hope they always have this joy for swimming that they do now. What does it mean to be a good mom? That is a question I wouldn't have asked myself before yesterday knowing full well that I love my girls and try to do all I can to protect them... but it keeps going around and around in my head and I just can't stop asking. We had the scariest of all scares last night, when darling little Annelie had to be rushed to the emergency room. The reason? 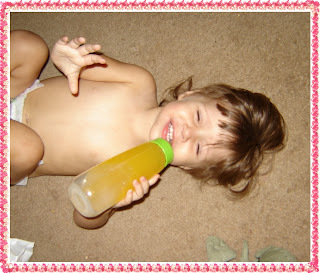 Because I stupidly left my colored pencil solvent out - a solvent that I ALWAYS put away... always always always- and I caught her a moment too late, as she put the bottle up to her mouth and took a drink. She is fine. Don't be worried. But it could have been much much worse. It could have been deadly. And I can't stop kicking myself. And wanting to shake myself and say,"What were you thinking, how could you have left that out? You know it is unbelievably toxic... even the fumes are toxic!! And you know that Annelie climbs onto the table the second someone leaves a chair out! And you know, that 20 month old babies get into more trouble than babies of any other age and know no danger... How could you have left that out?? What were you thinking????" Accidents happen. That is true. But it doesn't help me feel better about last night's events. 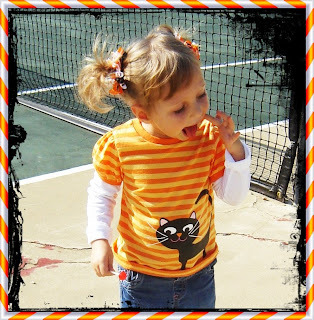 The second Annelie took a swallow, she started coughing and screaming and crying. Because of that, she didn't drink very much, but she did inhale it into her lungs. I called 911 and was directed to call Poison Control, who told me that she had to be taken to the ER immediately. We got in the car and drove across town, the weather horrible, the roads flooding and with no idea where the ER even was. Annelie was sick in the car, which was even scarier as the solvent does more damage if it is thrown up... and of course it was excruciating just watching her and knowing that I had to stay in my seat and hope that she would be okay. 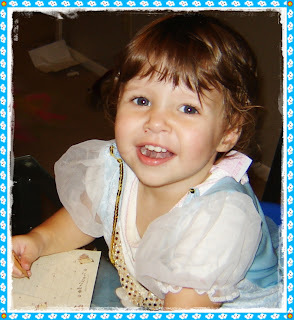 The doctors saw her right away and were instantly relieved that she hadn't had a seizure. She was still coughing, but wasn't sick again after the time in the car. She had chest x-rays so they could see if her lungs were swollen from inhaling the solvent. Her breathing and vitals were monitored for nearly three hours. In the end, Annelie came home unharmed. Her coughing stopped and she never developed a fever so the risk of pneumonia went away. 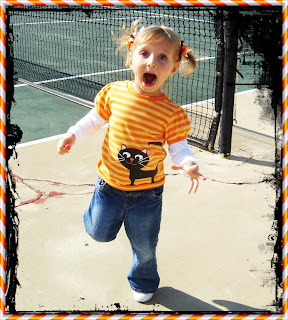 And she was back to her usual silly, singing, dancing, and troublemaking self in no time. And I continue shaking, even now as I type this - 24 hours later, just as hard as I was when she first picked up the solvent and I began running from across the room, knowing that I would be too late. But the feeling that I was irresponsible for a moment and that in that moment, my life would have been turned upside down and inside out, if she had only swallowed a drop more, just rips me apart and fills me with doubt and fear and all of the 'what ifs' that we parents try to ignore, lest they eat us alive.